In 1997 Triumph came out with a couple of world conquering motos, a new bug-eyed Speed Triple, the T509, and this, the T595 Daytona. Sumptuous lines proclaiming great British design, with the grunty 959cc triple cylinder engine housed in a curvy tubular frame, laying down power to the tarmac with a clean single-sided swing arm. Yes, Ducati held the world in sway with its iconic 916 but give me this dragonslayer anyday! The yellow like a fiery blast from this historic marque. The phoenix was surely reborn. it has gone from strength to strength since then. Maria Costello MBE is considered one of the fastest gals on two wheels: setting a womens lap record at the Isle of Man TT in 2004 with an average speed of 114.73mph (which just so happens to be commencing this weekend for a fornight of roadracing fun). Here she tests a 675 Triumph Daytona which she rode in the 2008 series of the “Triumph Triple Challenge”. Bob Dylan’s career was going stratospheric when, on July 26th, 1966,he took his Triumph out for a jaunt and managed to wrap it, and himself around a stationary object. Some believe it was a front to just jump off the planet chaos. Here’s an interesting painted interpretation of his mishap. It was his birthday on the 24th. 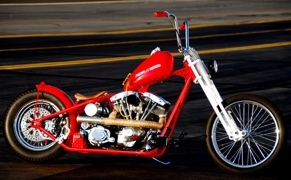 Keeping on the theme of Radio Flyer here’s a custom v-twin in resplendent red enamel and white forks paying homage to every American boys first ‘vehicle’. A lot of work goes into these special builds and in this case it certainly shows. Long straight roads, SoCal sun and a twist of the wrist & off you go! 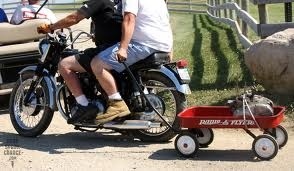 When trawling around a swap-meet, looking for those hard to find parts for that never ending project in the shed; what better way to tote your booty around with than a Radio Flyer truck… Then when you pick up a BSA pre-unit A10 you’ll need to trailer that extra engine ’round too! Inventiveness Rules! The main character played by British actor Jason Isaacs (also known as the long blonde haired death eater Lucius Malfoy). The shows premise is that he exists in two realities after a car crash, one where his wife died but son survives; the other ‘awake’ reality vise versa. 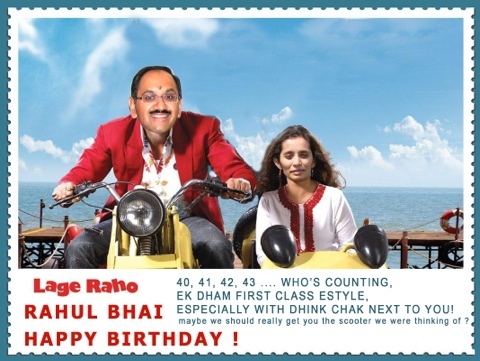 My work colleague, Asha, sent me this fun card of her sister and brother-in-law, Shobha and Rahul, photoshopped on a bright yellow combination as the chair occupant and driver respectfully. It celebrates his ‘early forties’ birthday. 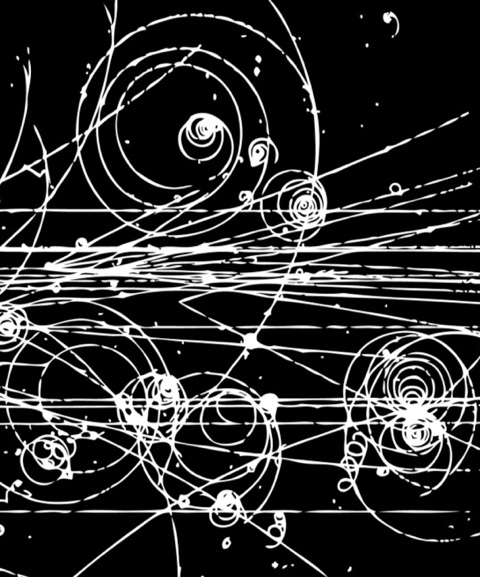 Like some feint streakline of a charged particle in a bubble chamber, such as an alpha or beta ray; here is some image manipulated view of a Scrambler. The glowing outlines defining the effervescent lines of this Brit modern classic. 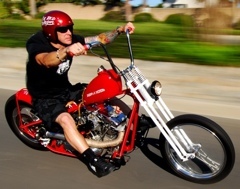 Here it is larger… an elephant header wide wheeled moto with ape bars and tall sissy bar. At least it has two wheels! 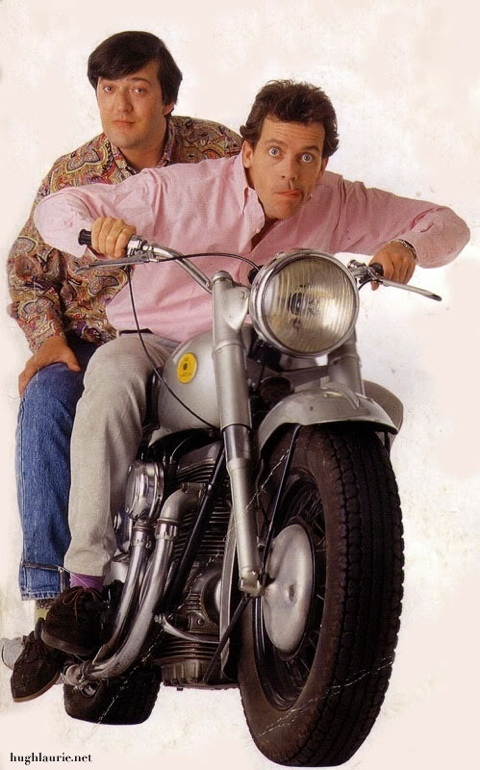 I was watching a couple of episodes of the classic comedy Blackadder; two of the characters being played by the duo Stephen Fry and Hugh Lawrie, both known at sometime or other as bikers. 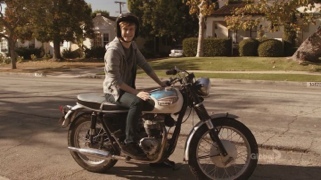 Hugh is a known Triumph owner and active rider (see previous article) and Stephen a onetime city rider. I found this superb early shot of the pair aboard The Sunbeam S7. 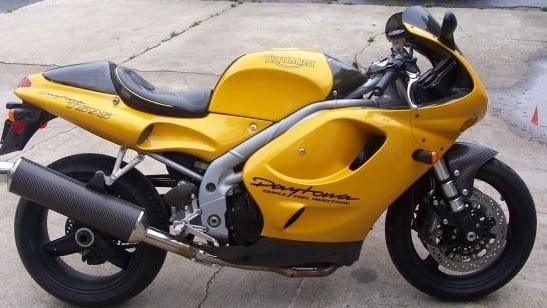 A beautiful longitudinal twin with double swoop exhaust pipes on one side. …when those four are on the corners of a smasher of a sports car from the seventies. 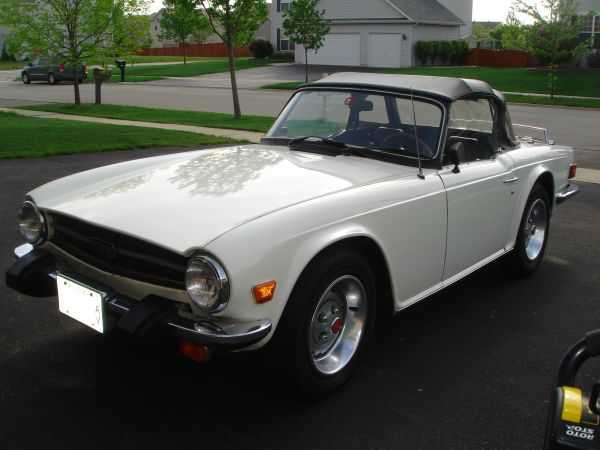 In this case the unparalleled Triumph TR6 the young sibling of earlier raceworthy greats like the TR2 or alternative cousin to the sweetlined, albeit underpowered, Spitfire. 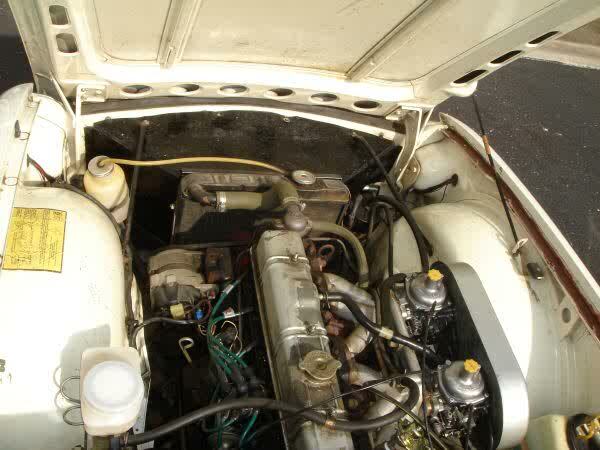 The inline 2.5l six gave oomph enough for a spirited drive around the countryside. The proportion of the square jawed body with large wheels designed by the German Karmann house gave this sportster a fresh and desirable look for any respectable driving glove-clad, tweed cap wearing ‘autophile’. 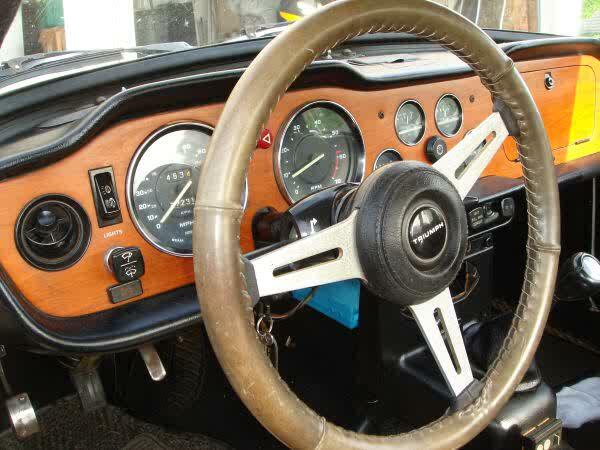 Indeed the sparse dashboard provides the road-pilots cockpit; backed with wood and instrumented by Smiths. 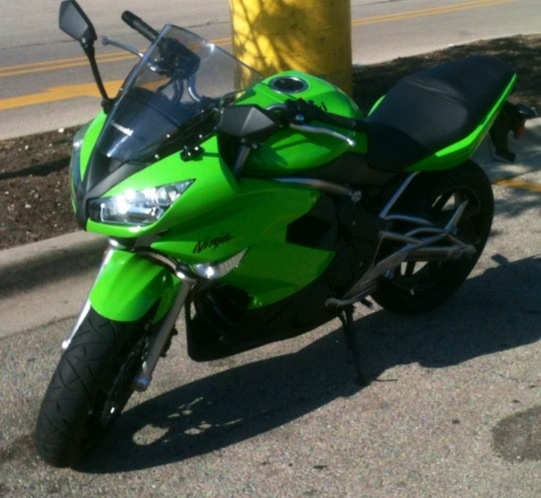 Nope it’s not Gordon Gekkos new money driven mantra, but a tasty as apple-pie Kawasaki Ninja 650. Team Green’s current midweight racer fits the bill for fun: the parallel twin being a true modern incarnation of our Trumpet Bonny. 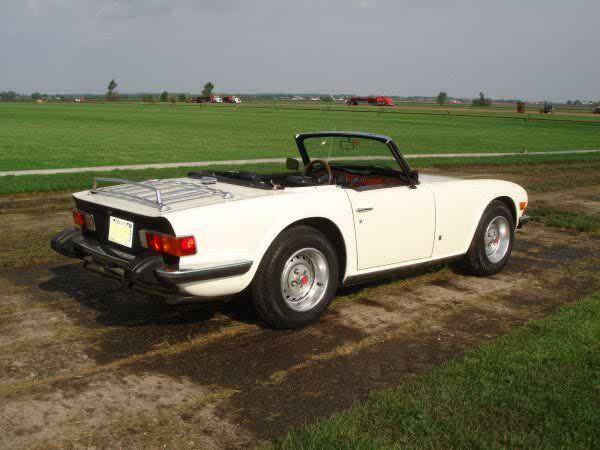 This thing looks perfect for the city, the twisters and perhaps a long distance haul or two. The colour is spot on too! I saw this brand spanking new one on the way to work today; it’s exhaust still pinging from an early morning run. The actor Joseph Fiennes takes on a moody bikers attitude with this Triumph Scrambler. A cool cucumber but needs an adventure or two on the open, and probably bumpy, road before he can attain a sublime worldliness like his cousin the great Ran Fiennes.